Times Of War is an electronic magazine (e-zine) free of charge on wargames and military history. The magazine addresses a variety of scales wargames and historical periods: ancient, Renaissance, Napoleonic, American Civil War, Spanish Civil War, modern war and especially the wargame of WWII Flames of War. 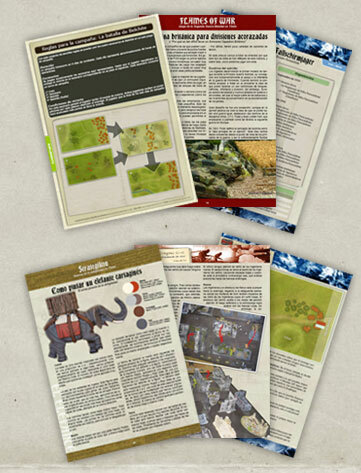 The ezine emerged within the community Wargames Spain. The project to create an electronic journal was begun in the fall of 2006 and once was enough editors and articles gathered to launch the first issue, we set to work to make our little creature. After several tests design and editing are able to create an electronic journal content visually appealing and interesting to readers, and this is how in September 2006 came to the first edition of Times of War. Today has been established to follow an editorial line in content and structure, painting and modeling articles, articles of rules, tactics and army lists Flames of War, Fields of Glory and other wargames, background and history together scenarios created for various wargames and a fixed section of Community, which includes reviews of the tournaments in Spain, upcoming events, competitions. Due to time the magazine has been on standby temporarily while many contributors and readers who claim to continue the magazine, for the moment the only thing that arises is to publish an edition collecting extra items or a special issue devoted to a topic or wargame in particular.